WASHINGTON -- Donald Trump once questioned the wisdom of taking vacations. "What's the point?" he asked. But now the president is getting ready to join the annual August exodus from this town he calls "the swamp." 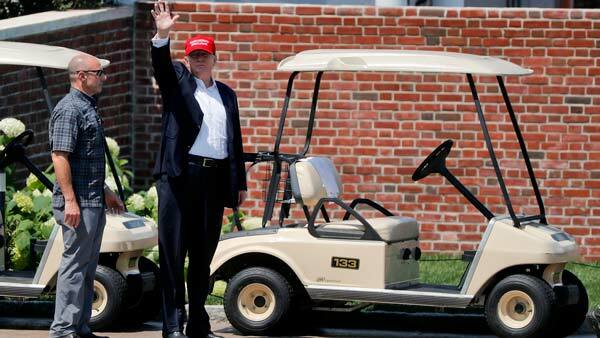 Trump is due to set out Friday on his first extended vacation from Washington since the inauguration - a 17-day getaway to his private golf club in central New Jersey. "Don't take vacations. What's the point? If you're not enjoying your work, you're in the wrong job," Trump wrote in his 2004 book, "Trump: Think Like a Billionaire." "BarackObama played golf yesterday. Now he heads to a 10 day vacation in Martha's Vineyard. Nice work ethic," Trump tweeted in August 2011.